These Tortoises control dreams while you sleep, by putting on these dream goggles. Yeah! I saw that post. Shelby sounds like a character. 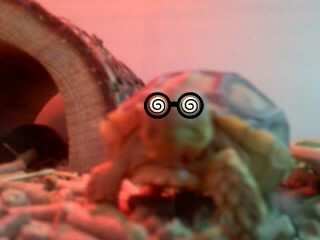 That is my roommates tortoise seymour. We have a total of three baby African Sulcata's. Alexandra, and Ernie are Seymour's brother and sister. They are about 8 months old.